Nanhua Pagoda is located 22 km southeast of Shaoguan in Guangdong Province. It was founded by the monk Huineng, also known as the Sixth Patriarch, founded the Southern School of the Chan Sect . It is a Buddhist shrine with a history of 1,500 years. It is acknowledged as the ancestral home of Zen, a Chinese branch of Buddhism. The pagoda is renown as architectural style, large quantities of precious relics, sculptures, gardens and inscriptions. 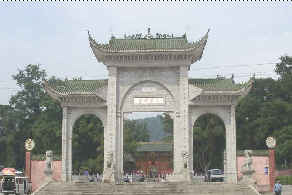 In 1983, the Nanhua Pagoda was designated a key national preserved cultural unit.